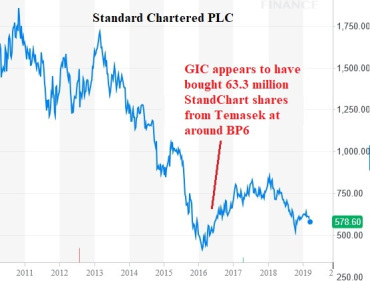 Did Temasek lose more than S$500 million selling 63 million StandChart shares to GIC? For years, Temasek owned 18% of StandChart (high of 19%). Some time in 2016, this was reduced to 16%. 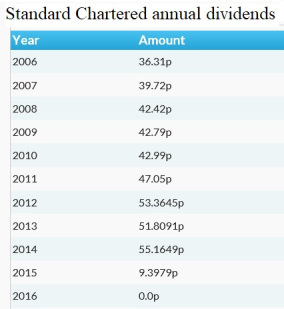 Point to note is Temasek had invested in StandChart at prices of between BP15 and BP20 between 2006 and 2008. Even if Temasek had subscribed to rights issues at various prices between 390 and 1280 pence, its average price appears to be still high at about 1350 pence. Total loss for 63.8 million shares = BP287 million/S$574 million. If Temasek had wanted to partially exit a lousy investment, it could have sold the shares in the open market. Instead, GIC – manager of CPF monies – was roped in. Is something not seriously amiss with such a transaction? BTW,the Khoo Family must thanks daft HO JINX for forcing them to sell Stanchart to TH. TH is just another clownish act. Passing baton from one clown to the other clown. @Phillip; If I have an ATM, money contribution from the 70%, I would be doing the same. On top of that I don’t need to explain anything and I don’t need to account for anything. If the don’t do the same I must be stupid. Have you heard of the saying; “When the river water is flowing, the two banks will be wet”. So when money is flowing, somebody can be benefited (wet in the pocket). the milo INDIAN who is malay from 9 to 5 istana over paid to prevent Dr Tan CB from asking the serious questions actually is doing citizens a great disservice by being in cahoots with pap clown. is S$m so great that it is nothing to participate in the lie? we can’t tell since we are not part of clown pap S$m gravy train. perhaps if we are paid S$m year after year we would also have our conscience seared like all these pap S$m clan members such as the milo INDIAN turn malay from 9 to 5 istana. Left pocket ? Right Pocket ??? Lots of “fishy” stuffs “happening behind” ??? She sold her SOILED underwear to her husband’s Company incurring a loss of $500 millions in her Mother of all Deep ATM Acc! Holee $moke! That’s why they said u can work until 80 yrs old even no employers willing to employ old folks. Cpf drawdown keep getting older. The bad news is not over. Temasek paid billions to Li Ka Shing (LKS) for a small stake in Watsons. To date, it has not listed so Temasek has no easy exit. LKS is in no hurry to list the company because he already got billions out of it from Temasek and he is still the major shareholder. It is sheer stupidity to buy a stake at Watsons without a put option on LKS if the company does not list within an agreed period. So Temasek has lost BILLIONS in Merrill Lynch, Barclays, Stanchart, Bayer (after its subsidiary Monsanto lost a court case big-time). So what else is new? Dafts will never know the truth until PAP is voted out. Stupid dead old fuc helped another familee to shift wealth out of China using dafts money. LKS is the first to sense and exit, well ahead of many others, who are now trapped with new control measures. We volunteered to be the sucker, buying into a problem that many will gladly exit. HNA will be next. 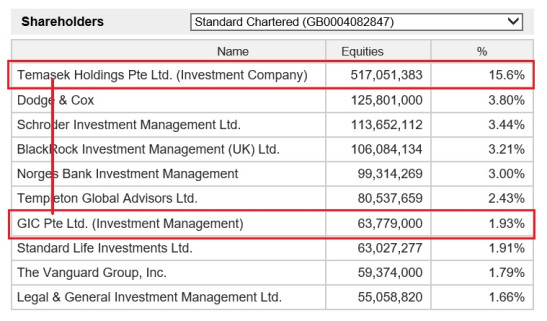 Temasick bought into Hainan Airlines Holding when other governments are already investigating it’s link to kleptocracy and money laundering for sometime. Stupid self entitled clowns using daft money get into the dirt while cleaning Chinese crooks.